The International Religious Freedom Report for 2013 released by the US State stated that the Bodu Bala Sena(BBS) continued to promote its anti-Muslim campaign, which was linked to violent activities last year. The report released at the US State Department by US Secretary of State John Kerry claimed that, local media and NGOs noted strong linkages between the BBS and the government. 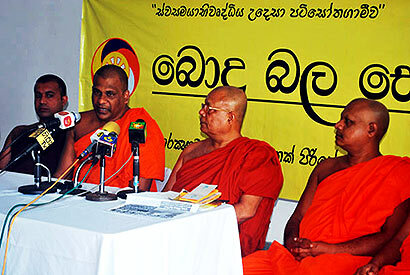 In Sri Lanka, the Sinhala Buddhist group Bodu Bala Sena (BBS) continued to promote its anti-Muslim campaign, which was linked to violent activities during the year. Local media and NGOs noted strong linkages between the BBS and the government. According to numerous reports, the BBS was behind a growing wave of anti-Muslim activities carried out by other violent Buddhist nationalist groups. Nationalist groups were allegedly involved in a series of attacks on mosques, protests over animal slaughter, and a sustained attempt to further marginalize Muslims by outlawing the halal system of meat certification. On December 1, Buddhist monks reportedly led a mob of 200 villagers that destroyed the Methodist Church of Habarana, located in Anuradapura District. Two Criminal Investigation Division (CID) police officers arrived at the scene and ordered the church to shut down, saying that it had no legal recognition to operate. Interesting, looks like no one will comment on this. I mean from the governing party. Will there be any voice for these types of statements? Hope proper authority will comment on this with facts and figures. And request US to come for a dialog on their claims.